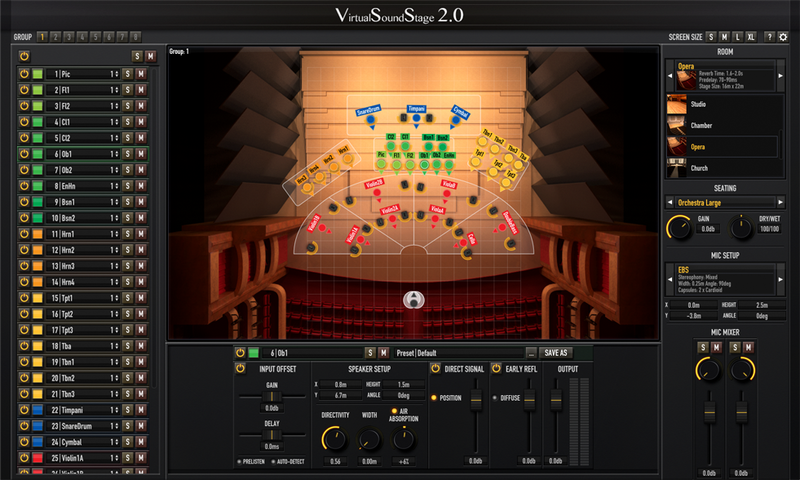 Virtual Sound Stage 2.0 has a completely redesigned user interface, which gives you control over all your instances from a single screen. Resize the user interface to fit your screen size. A quick link to this online documentation. Opens the preferences panel, where you can check your version and license and activate upgrades. Select the group to be displayed on the stage. Active groups are displayed in white. A list of all instances of VSS in your project. You can change their order by simply dragging and dropping a row. Assign the instance to one of the eight available groups. Always name your instances immediatly or you'll get confused later on. If your input signal is off to the side you can use the Input Offset to compensate for interchannel level and time differences and bring your source material back to the center before it's processed by VSS. When active, you can listen to the input signal, as it leaves the input offset section without any further positioning or reflections added. This is very handy while adjusting the gain and delay offset. When you start the Input Offset Auto Detection, Virtual Sound Stage will record and analyze a short section of the input signal and try to set the gain and delay offset for you. This is good as a starting point, but make sure to always double-check by ear. Controls the Directivity of the virtual speakers. A directivity of 0 means the signal will emit sound equally in all directions and if the directivity is set to 1, the sound will only be emitted in the direction of the speaker cone. 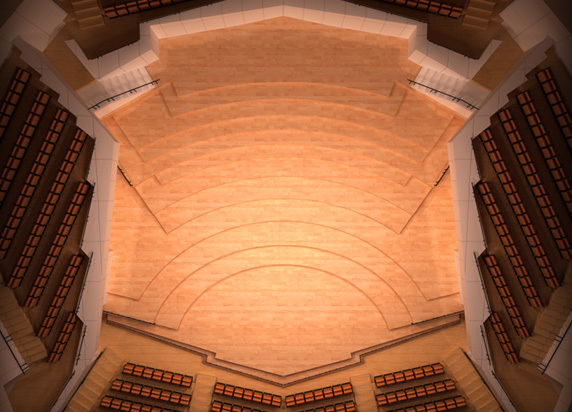 Controls the width of the virtual speaker setup. To keep the signal path clean there's a link between the left speaker and left microphone as well as the right speaker and the right microphone. This is crucial to eliminate any kind of phasing, but can result in unexpected positioning effects, if the speaker setup is not pointed towards the microphones. 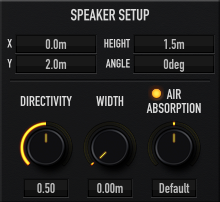 To quickly direct the sound source to the main microphone you can double-click the arrow in the stage view. If Air absorption is turned on Virtual SoundStage will emulate the effects that take place when sound travels through air. Depending on the setting of the Air Absorption Parameter and the distance between the sound source and the microphone this can result in either a damping or a boost of high frequencies. If your input signal has been recorded with a very close microphone you can use a higher air absorption level to damp more of the higher frequencies. If on the other hand the input signal already has been recorded from a distance, you can use a negative value to bring back some of the higher frequencies that have been lost during the original recording. Controls the level of the direct signal. If turned off the direct signal won't be touched by Virtual Sound Stage. 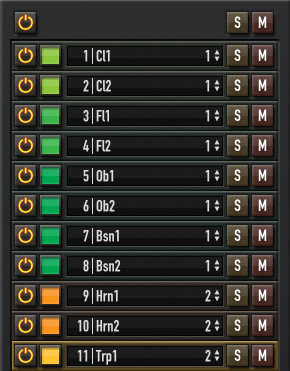 This can be usefull, if you only want to add some ER's to a track without changing its position. Controls the level of the Early Reflections. Add an extra Diffusor to the Early Reflections. This works well on very dry or percussive sounds. You can use the output gain to compensate for any gain differences between the input and output signal similar to a makeup gain control in a compressor. 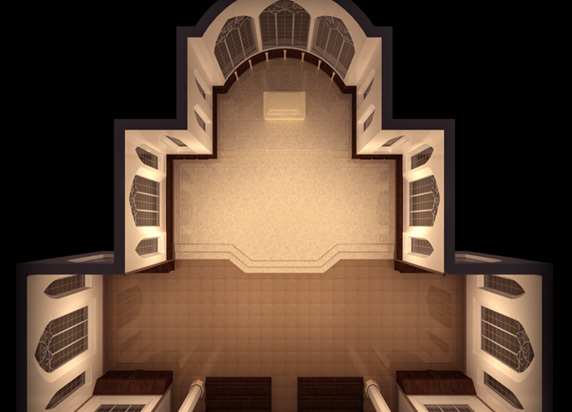 A list with all available rooms and a quick starting point for your reverb tail settings. 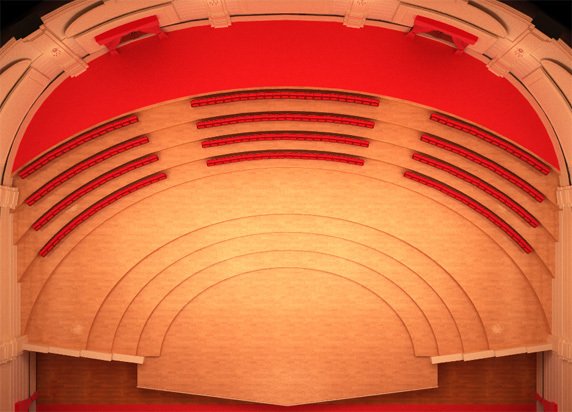 Choose a seating plan as a guide, while you position your instruments. A global gain control effecting all instances. Changes the ratio between direct signal and early reflections in all active instances. Choose a microphone setup from the list and set its position. Here you can change the level and panning of individual microphones. 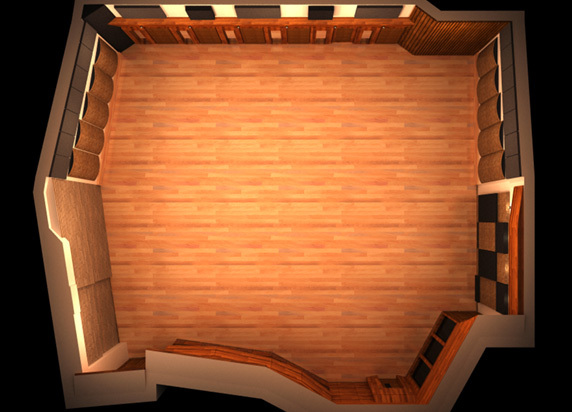 The PRO Version of Virtual Sound Stage 2.0 comes with 9 carefully modeled spaces for you to choose from. If you want to use Virtual Sound Stage only as a replacement for the pan controls in your DAW mixer, without adding any extra room information simply choose the Free Field from the Room Menu. This will put your sound sources in an empty space and will free up the CPU resources normally needed to generate reflections. On Windows make sure to select the right folders for the VST plug-ins, so your DAW can find them. Open your DAW and load an instance of Virtual Sound Stage 2.0. At first launch you'll be asked for your keyfile. Click "open" and select the keyfile you received with your order. For the LITE to PRO Upgrade first activate the LITE version, then go to the preferences panel (top right corner), click on Activate Upgrade and then select your Upgrade keyfile. That's it! 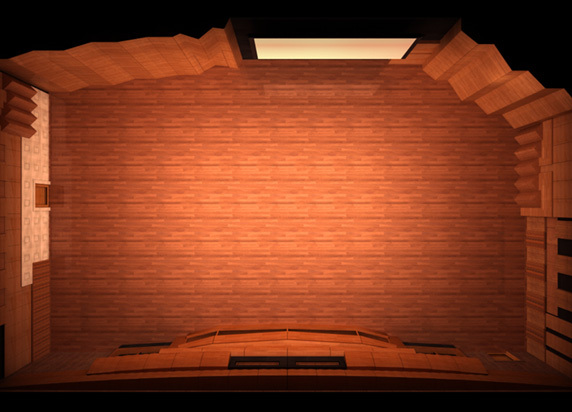 Virtual Sound Stage 2.0 is now successfully installed and activated. 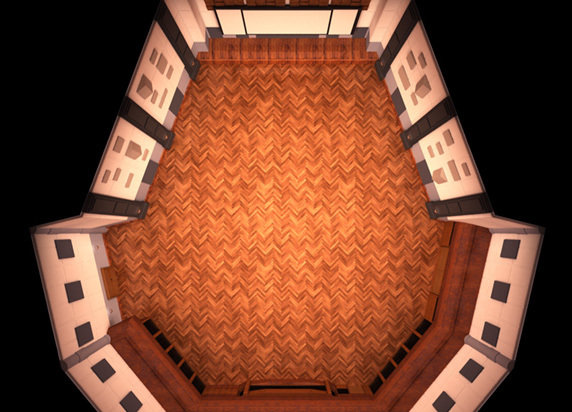 You’ll need an instance of Virtual Sound Stage for every instrument you want to put into the virtual room. So first of all you need to make sure that all of your instruments are available as seperate stereo tracks within your DAW. Some samplers like Kontakt by default only use one single Master Stereo Output for all patches, but most of them will also give you the possibility to switch to a setup with multiple outputs to route your instruments separatly into your DAW. In general this is a much better setup, as you’ll have more control over your mix directly from within your DAW and it also makes it possible to add VSS to your project without using one instance of your sampler per instrument. 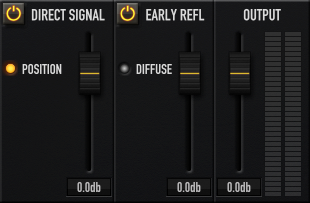 This is probably also a good time to start setting up a reverb send bus with a generic reverb tail, so you can quickly add some reverb to your tracks while setting them up with VSS. For more tips on how to find the right reverb tail also see the next section. Now that the routing is prepared you can start adding VSS as an insert effect to one of your tracks. I highly recommend that you name your instances instantly and also choose a rough position, so things don’t get messy. Start with the Input Offset by activating the Pre-Listen function to hear the signal as it leaves the Input Offset. The goal is to get the input signal as close to the center as possible. You can give the Auto-Detection a try, which will analyze a short section of the incoming signal and try to set the input offset for you. While the gain adjustment is mostly pretty accurate, calculating the right amount of Delay Offset is very hard and for some input signals even impossible, so always double-check and adjust the settings until the signal is in center position. 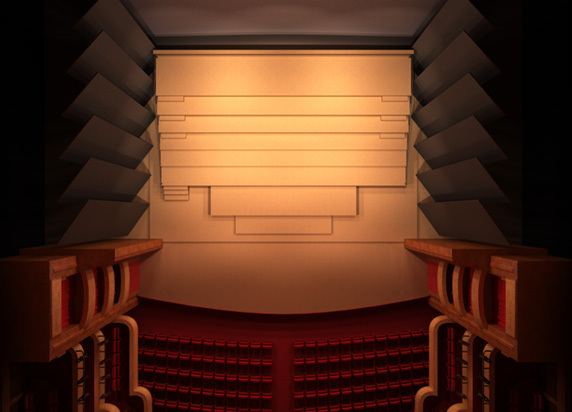 After you have chosen the right position and direction for your sound source, maybe using one of the seating plans, the next step is adjusting the Early Reflection Level in combination with the Reverb Send, depending on how dry the source material is. Next you can tweak the sound even further with the Air Absorption, Width and Directivity controls and maybe come back to readjust the ER level afterwards. Finally you can use the Output Gain to compensate any gain differences between input and output, similar to the makeup gain in a compressor. After you have added Virtual Sound Stage to each of your tracks and adjusted the default settings to the input signal the fun part begins as you can start experimenting with different rooms and microphone setups. As you switch between setups, you can use the master Gain and Dry/Wet controls to quickly readjust the overall balance. When you change the room remember to also switch to another reverb tail to match the Early Reflections, while using the reverb bus fader to control the overall level of the reverb tail. 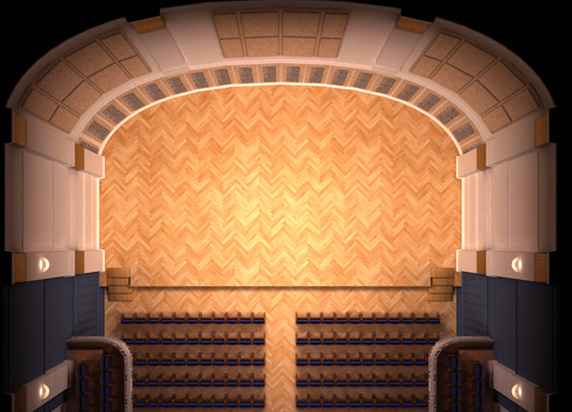 Early Reflections are the decisive factor when locating sounds within a room, but if you want to create a convining room impression, finding the right reverb tail is also extremely important. Always use a send bus for the reverb tail. This will not only save you CPU performance, but will also give you more flexilibity and control. You can set the send level individually for every instrument, while using the reverb send bus fader as a global reverb tail level control. Most reverbs also benefit from the higher input level and yield better results compared to summed up individual instances with lower input levels. Use either a convolution reverb, which gives you the ability to remove the ER’s of the Impulse Response with a fade-in or an alogrithmic reverb, which lets you lower the level of the ER’s. You can use the values from the room descriptions as a reference, but remember that the time it takes for the reverb tail to built up will vary from reverb to reverb and maybe also from patch to patch. 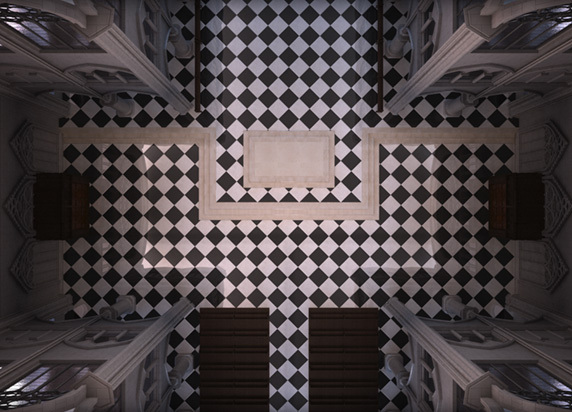 In general you want to aim for a smooth unnoticable transition between the Early Reflections generated by VSS and the reverb tail, avoiding any gaps, but also without masking to much of the ER's. In the end this is really a matter of taste, but it plays a huge part in the overall room impression. Again there are some recommendations in the VSS user interface to give you a rough estimate of the decay times one would expect in these venues.